Sarah Averill Wildes was a woman from Topsfield who was accused of witchcraft during the Salem Witch Trials. Sarah Averill Wildes was born sometime around 1627 to William Averill and Abigail Hynton Averill in Chipping Norton, England. The family later moved to the Massachusetts Bay Colony around 1637 where they settled in Ipswich, Mass. Sarah Averill had previous brushes with the law before her witchcraft accusation in 1692. In 1649, Sarah was brought before the Ipswich Quarterly Court and ordered to be whipped for fornicating out of wedlock with Thomas Wardwell and in 1663 she was accused of violating the colony’s sumptuary laws by wearing a silk scarf (Robinson 295). In November of 1663, Sarah married a local Topsfield judge named John Wildes, a widower with eight children whose first wife Priscilla Gould had died in April, and the couple went on to have one child together, Ephraim Wildes, in 1665. The family lived in a house that stood in the triangular area between Perkins Row and Meetinghouse Lane in Topsfield. “After the marriage of John Wilds and Sarah Averill, there had been war between them and John Gould and Mary Reddington the brother and sister of Priscilla, the first wife. It has been supposed that the ill feeling was caused by the hasty second marriage, but that does not seem likely, for in those days eight months was a long time for a widower to remain single. But whatever the cause the effect was the same and cost Sarah Wilds her life” (Topsfield Historical Society 30). The ill will towards Sarah continued for years and, even after Mary Gould Reddington passed away from natural causes years later, Mary’s friends continued to speak ill of Sarah Wildes. “The Wildes family belonged to the faction in Topsfield which was active in the feud with Salem Village. It is not possible to say whether this in any way influenced the prosecutors of Sarah Wildes. Ephraim Wildes, son of Sarah, deposed that the marshal of Salem came to Topsfield with the warrants for the arrest of his mother and William Hobbs and his wife. The marshal served that on Sarah Wildes, and young Wildes arrested Hobbs and his wife. Subsequently they accused his mother, and he thought it might be because he arrested them” (Nevins 205). 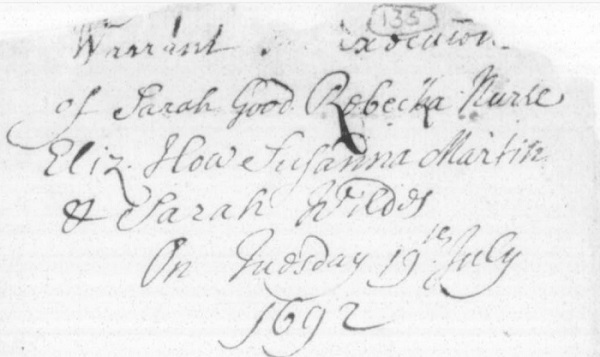 On April 21, 1692, Thomas Putnam and John Buxton of Salem Village made a complaint of witchcraft against Sarah Wildes, William and Deliverance Hobbs, Nehemiah Abot, Mary Easty, Edward Bishop and Sarah Wildes Bishop, Mary Black and Mary English, on behalf of Ann Putnam Jr, Mary Walcott, Mercy Lewis and other unnamed accusers. Sarah Wildes was arrested on April 22 and examined by Judge John Hathorne and Judge Jonathan Corwin at Salem Village the same day. John Wildes’ daughter (from a previous marriage) and son-in-law, Sarah and Edward Bishop, were also arrested that day as was John’s other daughter Phoebe Wildes. Only fragments of Sarah Wildes’ examination survive so little is known of the proceeding except that, during the examination, afflicted girl Sarah Bibber claimed to see Wildes’ spirit sitting on the beam of the meetinghouse. When the judges asked Wildes to respond to this charge she replied “I am not guilty Sir” (SWP No. 136.2). The judges stated that the girl’s behavior in the courtroom was clear evidence the she had been tormenting them. They also accused her of forcing the girls to sign the Devil’s book the night before. Wildes denied this as well, stating: “I never saw the book in my life and I never saw these persons before” (SWP No. 136.2). In addition, Wildes was also accused of hurting John Herrick’s mother-in-law, Goody Reddington, which she also denied although a man by the name of Captain How testified to confirm it. When the examination came to an end and the judges then ordered Wildes to be taken back to the jail, the afflicted girls all cried out that they saw her spirit on the beam and then fell into convulsions. Sarah Wildes was indicted on one charge of witchcraft against Mercy Lewis and was brought back to the Salem jail. [Judge:] It is said you were afflicted, how came that about? [Hobbs:] I have seen sundry sights. [Hobbs:] Last Lords day in this meeting house & out of the door, I saw a great many birds cats & dogs, & heard a voice say come away. [Judge:] What have you seen since? [Hobbs:] The shapes of several persons. [Judge:] What did they say? [Judge:] What neither the birds, nor persons? [Judge:] What persons did you see? [Judge:] What is that? Did either of them hurt you? Deliverance Hobbs was examined again in prison the following day where she once again confessed to being a witch and accused Sarah Wildes and many others of participating in a secret witch meeting, led by Reverend George Burroughs, in a pasture by Reverend Samuel Parris’s house the previous morning. Hobbs went on to explain that Wildes was the one who notified her of the meeting and told her at the meeting that if she signed the Devil’s book she would give her some clothes and would stop afflicting her. On May 3, Hobbs was examined in prison yet again, during which she again accused the others of urging her to sign the Devil’s book and stated that Sarah Wildes and others participated in a “feast both of roast & boiled meat & did eat & drink & would have had me to have eat & drank with them, but I would not; & they would have had me signed, but I would not” (SWP No. 70.4). On May 13, Sarah Wildes was transferred to the Boston jail. She was later transferred once again to the Ipswich jail and was then sent back to the Salem jail on June 18, where she remained until her trial began on June 29. Sarah Wildes’ trial began on June 29, 1692 at the former courthouse on what is now Washington street in Salem. A number of people testified against Wildes during the trial, including Reverend John Hale, Ann Putnam Jr, Mary Walcott, Nathaniel Ingersoll, Elizabeth Symonds, John Gould, Zacheus Perkins, Humphrey Clark, Thomas Dorman, John Andrews and Joseph Andrews. The only people who seemed to come to Wildes’ defense was her husband, John, and her son, Ephraim, who testified on her behalf. On June 30, two of the afflicted girls, Ann Putnam Jr and Mary Walcott, testified that they didn’t know Sarah Wildes but that she had been afflicting them since the spring. Ann Putnam Jr testified that a specter who said that her name was Wildes and that she was from Topsfield had been afflicting her since March and that she afflicted her again on the day of her examination by pinching, pricking and choking her. Mary Walcott also testified that a specter who told her her name was Wildes and that she lived in Topsfield began afflicting her in the beginning of April by pinching and pricking her and that she afflicted her again on the day of her examination by striking and choking her as well as Mercy Lewis, Abigail Williams and Ann Putnam Jr. Both Nathaniel Ingersoll and Thomas Putnam also testified that during conversations with the afflicted girls “we have often seen them afflicted and heard often them say that one Goody Wildes of Topsfield did torture them” and went on to describe how every time Sarah Wildes looked at the girls or clenched her hands during her examination they were struck or choked by invisible forces and that “we believe that Sarah Wildes the prisoner at the bar has several times afflicted and tormented the affore named persons by acts of witchcraft” (SWP No. 136.10). Marilynne K. Roach points out, in her book, The Salem Witch Trials: A Day-by-Day Chronicle of a Community Under Siege, that except for the testimony from the afflicted girls, most of the evidence against Sarah Wildes came from the family and friends of her husband’s first wife, Priscilla Gould. Much of this testimony consisted of stories from over a decade before when the witnesses believed Wildes had afflicted them or their livestock in some way. For example, John and Joseph Andrews, who were friends of the Reddington family, testified that about 13 years ago they asked to borrow a scythe from Sarah Wildes but she said she didn’t have one to lend. When a neighbor pointed the men towards John Wildes Jr’s scythe and they took it without Sarah’s permission, she became very angry and sent young Ephraim after them to demand the scythe back, which they refused to do until they were done with it. Later that the day the brothers explained that while they were loading their cart with hay their oxen suddenly refused to move. One of the brothers said he then saw a mysterious creature hiding behind a tree and felt frozen to the spot but the oxen suddenly became spooked and ran down the steep hill dragging one of them with it and overturning the cart in the process. “all which made us then to think and ever since have thought: and still do think that Goody Wildes who now stands charged with high suspicion of several acts of witchcraft had a hand in our mishap at that time” (SWP No. 136.15). John and Joseph’s sister, Elizabeth Symonds, also testified that while on her way to visit Goody Reddington with her mother shortly after, they ran into Sarah Wildes and got into an argument about the incident with the hay. Symonds stated that during the argument Wildes gave her a look that caused her to tremble and later that evening she was visited by a spectral cat who laid on her all night and prohibited her from speaking or moving. Symonds also testified that she was afflicted again the following day when she saw Wildes at the meetinghouse and experienced a sudden pain in her back that was so severe she fell off her seat and had to be carried out of the meetinghouse and continued to suffer from those pains ever since. Another witness, John Goulds, testified that 15 or 16 years ago his sister, Mary Reddington, told him that Sarah Wildes specter had attacked her while she was riding her horse and ended up pulling her off of the horse backwards into a creek and holding her down until her brother and Sergeant Edmond Townes helped her up. Although some sources have interpreted this testimony as a claim of an actual physical attack by the real life Sarah Wildes, Gould’s testimony suggests it was a spectral attack when he explained that his sister later asked him to write down this account of how “Goodwife Wildes did afflict her” but became afflicted again when trying to recount it and couldn’t speak. On July 2, Reverend John Hale of Beverly testified that about 15 or 16 years ago, Goody Reddington visited him and told him she had been bewitched by her neighbor Sarah Wildes and claimed that Sarah’s son-in-law, John Wildes, came to her and also said he believed his mother was a witch. In addition, Hale recalled an incident about 20 years ago in which Sarah Wilde’s son-in-law, Jonathan Wildes, began acting very strangely and many felt he was bewitched which made Hale now suspect it was by Sarah Wildes. Other testimony against Wildes came from a man named Thomas Dorman who explained that his cattle and geese suddenly became afflicted and died six years ago after Sarah Wildes bought a bee hive from him and he later heard from Ann Putnam that Wildes was responsible for the animal’s deaths, even though he didn’t know how Putnam even became aware of the incident. Another man, Humphrey Clark, testified that the previous year he had been sound asleep in his bed when he felt the bed suddenly shake and awoke to find Sarah Wildes standing at the foot of his bed before she suddenly jumped to the other corner of the house and then disappeared. Sarah Wildes’ husband, John, testified that when he first heard that Mary Reddington was spreading rumors that his wife was a witch he told her husband John Reddington that if she continued he would have Mary arrested for defamation but John asked him not to because it would bankrupt him. Reddington said he wife would eventually stop on her own and that he personally had nothing against Sarah. Sarah and John’s son, Constable Ephraim Wildes, testified twice on his mother’s behalf stating both times that he believed the accusations against his mother were an act of revenge by the Reddingtons and their friends. He described how four years ago he sought marriage with one of Goody Symonds daughters but it never came to fruition because of rumors Mary Reddington had spread about his mother amongst the Symonds family, prompting him to never return to the Symonds house “and ever since she been very angry with me and now she will reward me” (SWP No. 136.5). “I have had serious thoughts many times since whether my seizing of them might not be some case of her thus accusing my mother thereby in some measure to be revenged of me the woman did show a very bad spirit when I seized: one might almost see revenge in her face she looked so malicious on me” (SWP No. 136.6). After all the testimony was heard during the week-long trial, the jury found Sarah Wildes guilty of witchcraft and she was sentenced to death. On July 19, 1692, Sarah Wildes was brought to Proctor’s Ledge in Salem and hanged, along with Rebecca Nurse, Elizabeth Howe, Susannah Martin and Sarah Good. The bodies were cut down after the executions and temporarily placed in a nearby rocky crevice but it is not known what happened to them after that. Convicted witches weren’t allowed to be buried in a graveyard and there is no evidence they were buried nearby. Even after Sarah Wildes was executed, other people continued to accuse her of witchcraft, such as Mary Gadge who, while testifying against Dorcas Hoar on September 6, 1692, mentioned that two years ago a young man named David Balch became ill and told her he was being tormented by witches, who he identified as Sarah Wildes and Dorcas Hoar as well as others he couldn’t identify. In October of 1692, Sarah Wilde’s stepchild, Sarah Wildes Bishop and her husband Edward Bishop, escaped from the Boston jail and fled to New York. As for Phoebe Wildes, there is no record of her case going to trial. On June 26, 1693, John Wildes married Mary Jacobs, the widow of George Jacobs, Sr, who had also been executed during the Salem Witch Trials (Roach 408). “To the honored gentlemen of the committee: it having pleased the great and general court to a point your honors a committee to inquiry who may be proper to be justified in the bill referring to the taking of the attainder and what loss and damage has been sustained by reason of the trials which were for witchcraft in the year 1692 under which sorrowful trial my mother Sarah Wild was condemned & executed: my father being now deceased and only my self left I here appear to give in some short account of the cost and damage we sustained in them times: my mother was carried to Salem prison some time in April we were at the cost of it and charged of keeping her there a considerable while and after wards she was removed to Boston prison we were at the cost of it and charged of keeping her there for about two months and then from Boston she was removed back to Ipswich prison we were at the cost of that and after a while she was removed to Salem again we were at all the cost both of caring and providing for her maintenance while in all these prisons: besides either my father or my self went once a week to see how she did and what she wanted and sometimes twice a week which was a great cost and damage to our estate my father would often say that the cost and damage we sustained in our estate was twenty pounds and I am in the mind he spoke less then it was: besides the loss of so dear a friend which cannot be made up: all which I leave to your honors consideration: I remain your honors humble servant Ephraim Wildes yet not withstanding twas twenty pounds damage to our estate considering our names may be repaired I am willing to take fourteen pounds” (SWP No. 173.40 ). 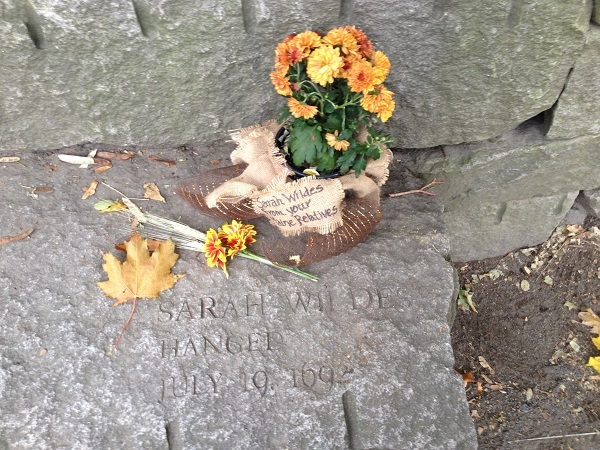 On October 17, 1711, the Massachusetts legislature passed a bill restoring some of the names of the Salem Witch Trials victims, including Sarah Wildes. On December 17, 1711, the Massachusetts legislature awarded Ephraim Wildes 14 pounds in restitution. In December of 1711, Ephraim Wildes signed a letter, along with 33 other victims and relatives, asking that Stephen Sewall acquire a copy of the 1711 act and collect their restitution on their behalf since traveling to Boston would be very difficult for them. 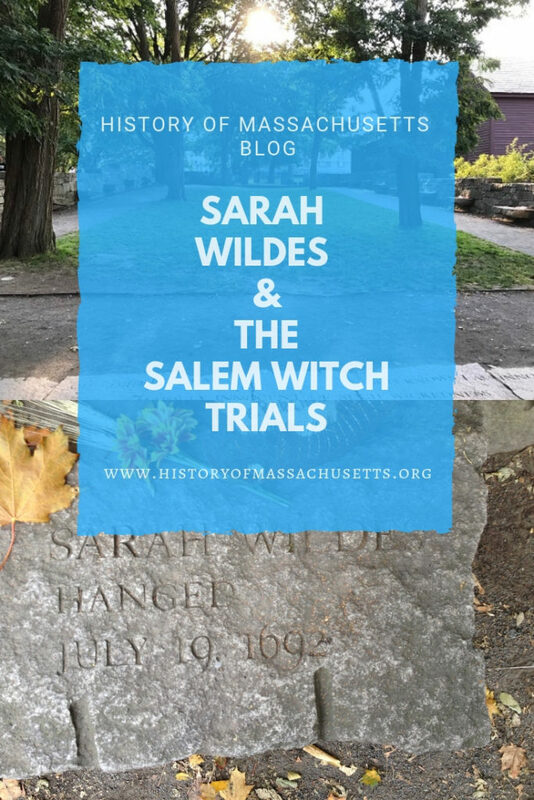 On the 300th anniversary of the Salem Witch Trials in 1992, the Salem Witch Trials Memorial was built in Salem, Mass and a marker was established for Sarah Wildes. 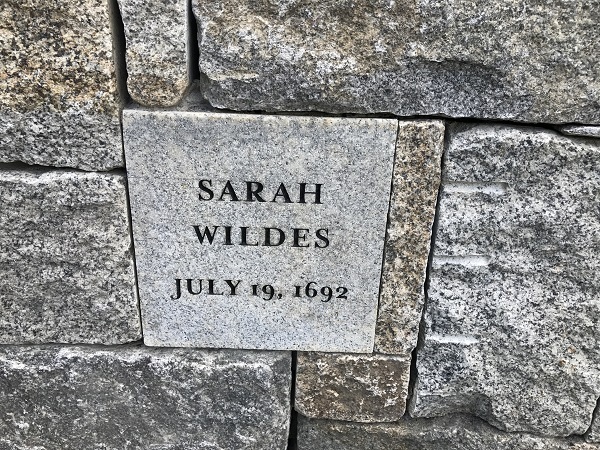 After the location of the Salem Witch Trials executions was discovered in 2016, the Proctor’s Ledge Memorial was built there in 2017 and a marker was established for Sarah Wildes. The location of Sarah Wildes’ grave has never been found. Address: Washington Street (about 100 feet south of Lynde Street), opposite the Masonic Temple, Salem, Mass. Memorial plaque located on Masonic Temple. Robinson, Enders A. The Devil Discovered: Salem Witchcraft 1692. Hippocrene Books, 1992. Nevins, Winfield S. Witchcraft in Salem Village in 1692. The Salem Press Company, 1916. Rosenthal, Bernard. Salem Story: Reading the Witch Trials of 1692. Cambridge University Press, 1995. Avery, Clara A. The Averell – Averill – Avery Family: A Record of Descendants of William and Abigail Averell of Ipswich, Mass. Vol. I, 1906. Roach, Marilynne K. The Salem Witch Trials: A Day-by-Day Chronicle of a Community Under Siege. Taylor Trade Publishing, 2002. Towne, Abbie Peterson and Marietta Clark. “Topsfield in the Witchcraft Delusion.” The Historical Collections of the Topsfield Historical Society, vol. XIII, 1908, pp: 23- 38.